Fernando Botero is a Colombian artist who employs a range of media in his ongoing exploration of the human condition. Alternately wry and deeply emotional, Botero blends beauty, violence, tradition, and modernity in his effort to convey the glories and miseries of contemporary life, particularly in Latin America. A separate but equally significant trend in Botero’s art is the study and revision of European masters. The absorption of lessons learned from artists preceding him is arguably the most important source of inspiration for Botero. The Baroque World of Fernando Botero includes 100 paintings, drawings, and sculptures drawn from the artist’s private collection. In his earlier works from the 1950s, Botero’s struggle to define his own style is still evident, but eventually the artist’s mature style in the form of enlarged volumes and distinctive, buoyant figures emerges. The exhibition examines Botero’s indebtedness to European artists such as 19th century French painters Dominique Ingres and Eugene Delacroix and Italian Renaissance artists Paolo Uccello and Piero della Francesca. It also acknowledges his interest in Mexican artists Diego Rivera, Frida Kahlo, and José Clemente Orozco and the great Spanish painter Diego Velazquez. 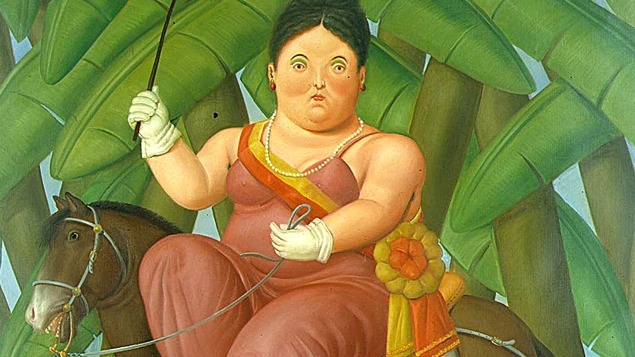 Although most of Botero’s inspiration and artistic labor takes place while he travels abroad, throughout his prolific career Botero has retained a distinctive Latin American flair in his work. True to the Baroque style, with which Botero is anachronistically associated, the artist’s mature style is marked by a degree of visual clarity and perfection of line inherited from the masters in whose work he immersed himself. The Baroque World of Fernando Botero offers insight into the artist’s many worlds: be it his role as a social critic, re-interpreter, cultural force, or product of the artists who preceded him.